Membership costs £15.00 GBP or €18.00 Euros. Return your membership form along with payment in the return envelope in your pack. 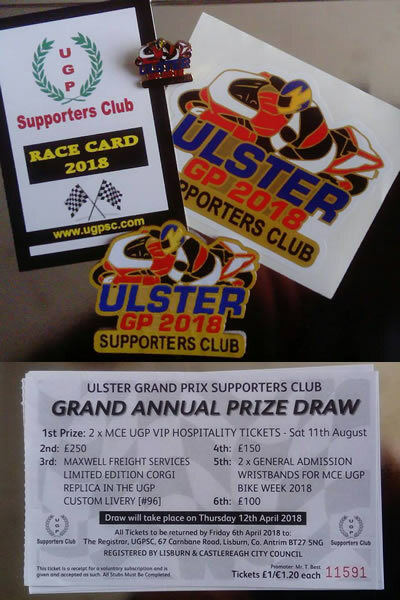 Pay in person at the UGPSC Stand at the Northern Ireland Festival of Motorcycling. Call into the Club Trailer during UGP Bike Week. The hassle-free way of ensuring your membership is paid each year and as soon as your bank honours the Direct Debit your membership pack will be sent to you. A Direct Debit mandate has been included in the Membership envelope for your convenience. Annual Prize Draw. We have six fabulous prizes to give away this year. To be in with a chance to win please return your ticket stubs as soon as possible as the draw takes place this year at our Annual General Meeting on Thursday, 12 April 2018.